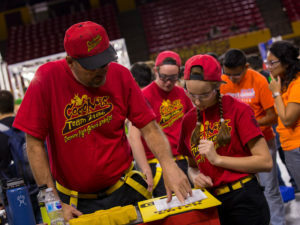 Arizona State University often hosts a number of traditional sporting competitions from football to swimming, but for the first time the university hosted the “ultimate sport of the mind” — the Arizona FIRST® Robotics Competition State Championship. 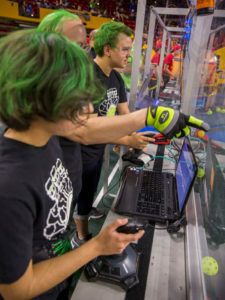 FRC challenges students to form a team, raise funds and hone a variety of technical, teamwork and other skills to build and program industrial-size robots over a six-week period. 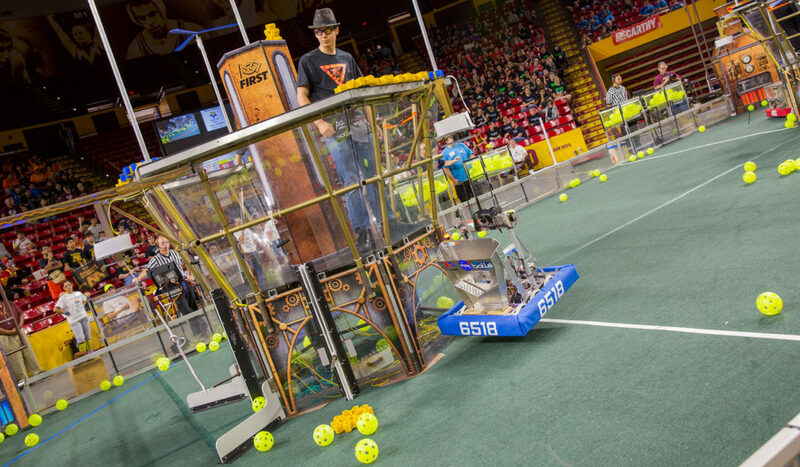 After participating in regional competitions across the Southwest, the top 30 FRC teams comprised of more than 700 high school students from around the state converged at Wells Fargo Arena on Saturday, October 21. 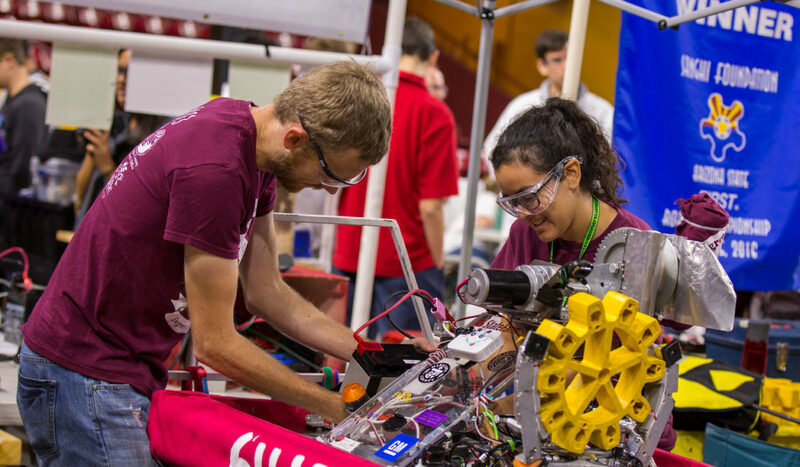 Student teams worked together in three-team alliances to solve the FIRST Steamworks challenge: gather “fuel” and gears needed to start an airship and then use deployed ropes for robots to pull themselves onboard. 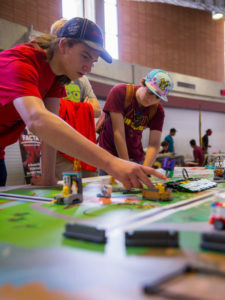 On the Wells Fargo Arena concourse, FIRST® LEGO® League, FIRST® LEGO® League Jr. and FIRST® Tech Challenge teams held demonstrations, showcasing the entire FIRST pathway from 1st grade FLL Jr. teams through high school FRC teams. The Ira A. Fulton Schools of Engineering and Access ASU were available to talk to students and parents about opportunities at ASU, and students were able to talk to college students and industry professionals. Hosting the competition came out of a new partnership between the Fulton Schools, Access ASU and the Sanghi Family Foundation, and initiated by Steve Sanghi, chairman of the board, president and chief executive officer of Microchip Technology, Inc. and member of the FIRST board, and ASU President Michael Crow, who wanted to bring all the Arizona FRC teams and their friends and families together for the competition and to explore FIRST and STEM opportunities from kindergarten through high school in addition to college and industry careers in the state. Ira A. Fulton Schools of Engineering Dean Kyle Squires noted in the event’s opening ceremony that he’s proud the Fulton Schools were involved with the FRC State Championship, calling it a great way to be involved in community STEM events and to show what opportunities the Fulton Schools offer for students to be successful at all levels. 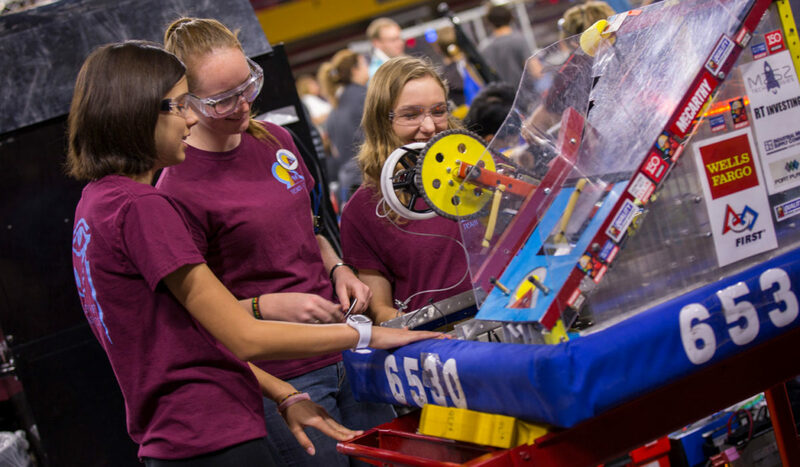 Sylvia Symonds, assistant vice president of ASU Educational Outreach, noted the importance of community events like the FRC State Championship to guide students to engineering and STEM careers. 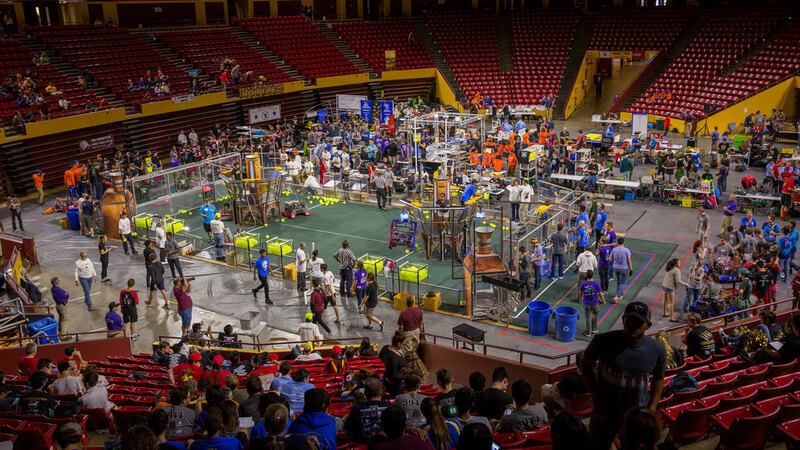 Just as ASU is committed to taking responsibility for the community per its charter, the university is committed to investing in STEM opportunities in the broader community — and it takes a community to support FRC teams. Mentors are an important part of FIRST programs, and often include industry professionals volunteering their time as well as former FRC students now attending college. 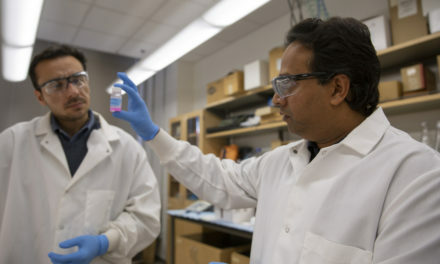 Sami Mian, a computer engineering graduate student at ASU and FRC mentor, says he learned a lot from his mentors while he was a high school student involved in FRC. “Mentors helped me learn different skills and helped me learn that I could make a career in engineering,” Mian said. At ASU Mian founded a robotics club and has continued to get involved the FRC community throughout his undergraduate and graduate studies. 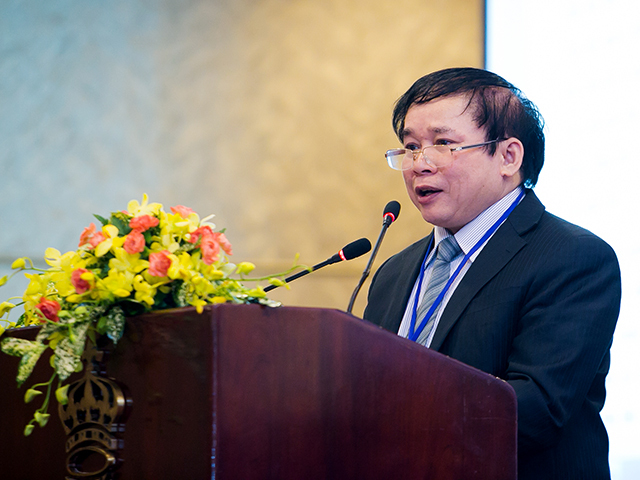 “I’m also giving back, and it helps me as a person because I love teaching,” Mian added. Mentors teach students a whole variety of skills. 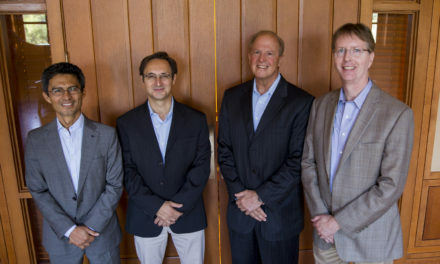 The mission of FIRST is to foster well-rounded life capabilities that include self confidence, communication and leadership as well as science, engineering and technology skills. 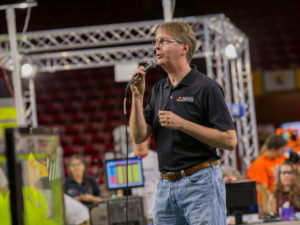 Rich Simoncic, vice president of the analog division at Microchip Technology and mentor of the Wolfpack team from Desert Mountain High School in Scottsdale, Arizona, is in his 12th year as an FRC mentor. He said he enjoys teaching and coaching students in technical and other skills. 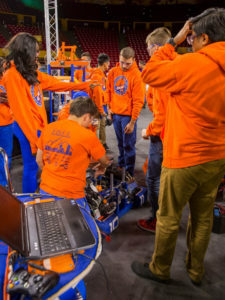 Teamwork among students in FRC is important to their success. 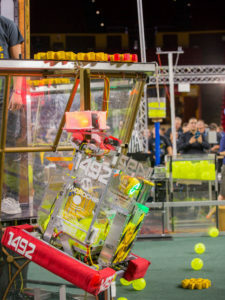 In addition to working together as a team to build their robot in the allotted six-week design period of the competition, they must also work with other teams in alliances, with each team’s robot completing a different task, in order to win rounds in the competition. 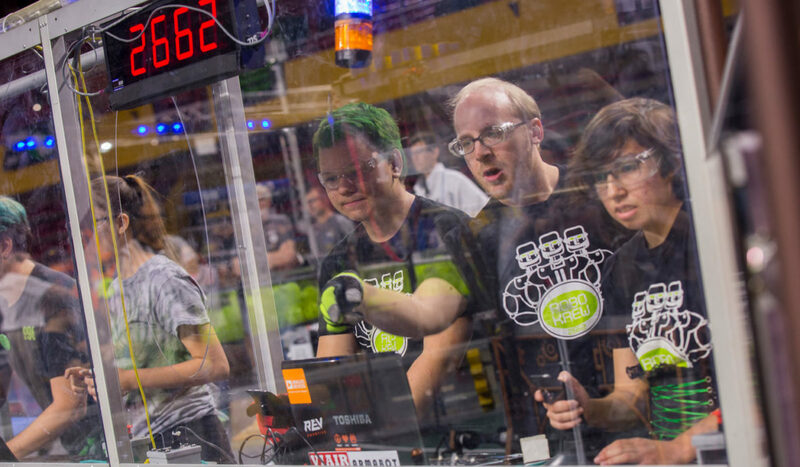 The FRC State Championship doesn’t count toward qualifying for the final FRC World Championship round, but it still comes with bragging rights, and a banner and trophy to display at upcoming competitions. And after teams travel across their regions, states, countries and even around the world, they get to come home and compete against and work with local teams. 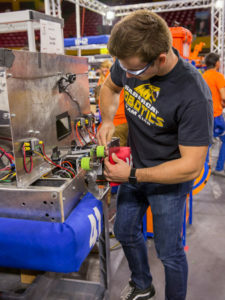 “The FRC State Championship is an opportunity for schools who have all done really well across [FRC] regionals to come together and compete with the best of the best in Arizona,” said Parker. 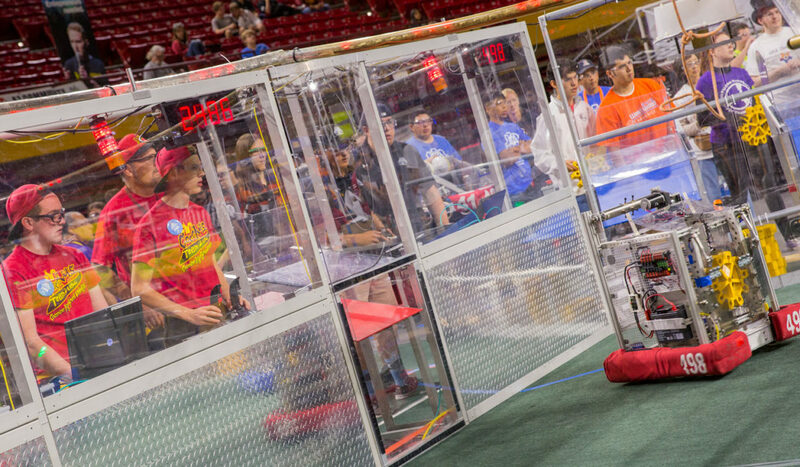 The Wolfpack and Team Crush have both competed at the FRC World Championship, but they were happy to compete with the best local teams at the Arizona FRC State Championship.